This person's surname is Scott Thomas, not Thomas. 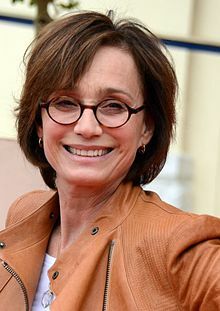 Dame Kristin Ann Scott Thomas DBE (born 24 May 1960) is an English actress. Five times a BAFTA Award nominee and five-times Olivier Award nominee, she won the BAFTA Award for Best Actress in a Supporting Role for Four Weddings and a Funeral (1994) and the Olivier Award for Best Actress in 2008 for the Royal Court revival of The Seagull. She was also nominated for the Academy Award for Best Actress for The English Patient (1996). Scott Thomas made her film debut in the Prince-directed Under the Cherry Moon (1986), and won the Evening Standard Film Award for Most Promising Newcomer for A Handful of Dust (1988). She has worked in French cinema, including in The Valet (2006), Tell No One (2007), Leaving (2009), Love Crime (2010), Sarah's Key (2010), and won the European Film Award for Best Actress for Philippe Claudel's I've Loved You So Long (2008). Her other films include Bitter Moon (1992), Mission: Impossible (1996), The Horse Whisperer (1998), Gosford Park (2001), Nowhere Boy (2010), Only God Forgives (2013), Darkest Hour (2017), and Tomb Raider (2018). Scott Thomas was born in Redruth, Cornwall. Her mother, Deborah (née Hurlbatt), was brought up in Hong Kong and Africa, and studied drama before marrying Kristin's father, Lieutenant Commander Simon Scott Thomas, a pilot in the Royal Navy's Fleet Air Arm who died in a flying accident when Kristin was aged five. She is the elder sister of actress Serena Scott Thomas, the niece of Admiral Sir Richard Thomas (a former Black Rod, the parliamentary ceremonial officer in the House of Lords), and the great-great-niece of the ill-fated explorer Captain Scott, who lost the race to the South Pole. Scott Thomas was brought up as a Roman Catholic. Her childhood home was in Trent, Dorset, England. Her mother remarried, to another Royal Navy pilot, Lt Cdr Simon Idiens (of Simon's Sircus aerobatic team flying Sea Vixens) who also died in a flying accident, flying a Phantom FG1 off the North Cornwall coast, six years after the death of her father. Scott Thomas was educated at Cheltenham Ladies' College and St Antony's Leweston in Sherborne, Dorset, both independent schools. On leaving school in 1978, she moved to Hampstead, London, and worked in a department store. She began training to become a drama teacher at the Central School of Speech and Drama, enrolling on a B.Ed in Speech and Drama. During her time at the school, she requested to switch degree courses to acting but was refused. After a year at Central, speaking French fluently, she decided to move to Paris as an au-pair and studied acting at the École nationale supérieure des arts et techniques du théâtre (ENSATT). At age 25, was cast opposite pop star Prince as Mary Sharon, a French heiress, in the 1986 film Under the Cherry Moon. Her breakthrough role was in a 1988 adaptation of Evelyn Waugh's A Handful of Dust, where she won an Evening Standard British Film Award for most promising newcomer. This was followed by roles opposite Hugh Grant in Bitter Moon and Four Weddings and a Funeral where she won a BAFTA for Best Supporting Actress. In 1994, she starred in the Romanian-French film An Unforgettable Summer, in which she played Marie-Thérèse Von Debretsy. Rather than learn Romanian for the part, she read her lines phonetically. She had all the lines translated into French, which she speaks fluently, so she knew what she was saying. In a 2002 interview for WENN, Kristin stated that this is the film that she is most proud of and that she views it as the peak of her career. [better source needed] In an interview for Gloucester Citizen on 22 March 2015, she cited An Unforgettable Summer as one of the films that she's most proud of alongside The English Patient and Only God Forgives. 1996 saw the release of her most famous role as Katharine Clifton in The English Patient, which gained her Golden Globe and Oscar nominations as well as critical acclaim. This was followed by a brief period working in Hollywood on films such as The Horse Whisperer with Robert Redford and Random Hearts with Harrison Ford. However, growing disillusioned with Hollywood, she took a year off to give birth to her third child. She returned to the stage in 2001 when she played the title role in a French theatre production of Racine's Berenice and on screen as Lady Sylvia McCordle in Robert Altman's critically acclaimed Gosford Park. This started a critically acclaimed second career on stage, in which she has received four nominations for a Laurence Olivier Award for Best Actress, including one win, for her performance of Arkadina in a London West End production of Anton Chekhov's The Seagull. She reprised the role in New York in September 2008. In summer 2011, Scott Thomas returned to London's West End to star as Emma in Harold Pinter's Betrayal at the Comedy Theatre. The revival was directed by Ian Rickson. Her husband was played by Ben Miles and the love triangle was completed by Douglas Henshall. In January 2013, she starred in another Pinter play, Old Times, again directed by Ian Rickson. In 2014, she appeared at The Old Vic in the title role of Sophocles's Electra. Scott Thomas also has acted in French films. In 2006, she played the role of Hélène, in French, in Ne le dis à personne (Tell No One), by French director Guillaume Canet. In 2008, Scott Thomas received many accolades for her performance in Il y a longtemps que je t'aime (I've Loved You So Long), including BAFTA and Golden Globe nominations for Best Actress. In 2009 she played the role of a wife who leaves her husband for another man in Leaving. In Sarah's Key (2010) — the story of the Vel' d'Hiv Roundup — Scott Thomas starred as an American journalist in Paris who discovers that the flat her husband is renovating for them was once the home of an evicted Jewish family. Other roles include the role of Elizabeth Boleyn, Countess of Wiltshire and Ormond, mother of Henry VIII's second wife Anne, in The Other Boleyn Girl, the role of a fashion magazine creator and editor in the film Confessions of a Shopaholic, the film adaption of Douglas Kennedy's novel The Woman in the Fifth, Lasse Hallström's Salmon Fishing in the Yemen, the 2012 film Bel Ami, based on the 1885 Maupassant novel, as a love interest of George Duroy (played by Robert Pattinson). and was also seen in Ralph Fiennes's The Invisible Woman, in Philippe Claudel's Before the Winter Chill, in Nicolas Winding Refn's Only God Forgives, which premiered at the 2013 Cannes Film Festival, Israel Horovitz's My Old Lady, the film adaptation of Irène Némirovsky's World War II novel Suite Française directed by Saul Dibb, and Joe Wright's Darkest Hour as Clementine Churchill, which nabbed Scott Thomas a nomination for BAFTA Award for Best Actress in a Supporting Role at the 71st British Academy Film Awards. In May 2017, it was reported that Scott Thomas has signed on to star as BMW heiress Susanne Klatten in the thriller Paramour, directed by Alexandra-Therese Keining. Scott Thomas is divorced from François Olivennes, a French gynaecologist, with whom she has three children: Hannah (1988), Joseph (1991) and George (2000). She has lived in France since she was 19, brought up her three children in Paris, and sometimes considers herself more French than British. ^ "Kristin Scott Thomas". BFI. ^ "Kristin Scott Thomas is bored with being labelled an ice queen". ^ "Kristin Scott Thomas". Yahoo Movies Canada. Archived from the original on 4 September 2014. ^ "Scene change". The Age. Melbourne. 12 October 2003. ^ "Kristin Scott Thomas Biography (1960-)". filmreference.com. ^ "Kristin Scott Thomas learning to be herself". The New Zealand Herald. The Observer. 7 March 2008. Retrieved 13 October 2011. ^ "- Person Page 2292". thepeerage.com. ^ Hattenstone, Simon (27 March 2003). "'I'm a horrible bully'". The Guardian. UK. Retrieved 22 June 2010. She was brought up as a Catholic and felt guilty about everything. ^ Hattersley, Giles (21 September 2008). "Kristin Scott Thomas, haughty but nice". The Sunday Times. UK. Retrieved 22 June 2010. ^ Wright, Richard (4 June 2018). "School reunion forty years on at Sidmouth hotel". Sidmouth Herald. ^ Central School of Speech and Drama (24 January 2018). "Oscars Nominations 2018". ^ Gilbey, Ryan (3 October 2014). "Kristin Scott Thomas: actor of many layers for whom the play's the thing". The Guardian. ^ Lawrence, Ben (17 April 2015). "Kristin Scott Thomas is bored with being labelled an ice queen". The Telegraph. ^ "Foreign Accents". The New Yorker. 14 October 1996. Retrieved 6 May 2017. ^ "Scott Thomas Recalls Romanian Film". Backstage. 8 January 2002. Retrieved 6 May 2017. ^ "Kristin Scott Thomas Most Proud Of Obscure Romanian Film". IMDb. 3 January 2002. Retrieved 6 May 2017. ^ "Chiwetel Ejiofor and Kristin Scott Thomas Win 2008 Laurence Olivier Awards". Playbill. Archived from the original on 4 December 2008. ^ Carole Horst (19 May 2009). "Rob Pattinson to star in 'Bel Ami'". Variety. Retrieved 11 January 2010. ^ "Kristin Scott Thomas to star in thriller 'Paramour'". ScreenDaily. 12 May 2017. Retrieved 16 May 2017. ^ "English rose at home in Paris". The Connexion. March 2011. Retrieved 8 July 2011. ^ "Clash de la semaine : Kristin Scott Thomas VS Sharon Stone". Excessif (in French). 1 February 2011. Retrieved 8 July 2011. ^ "Kristin Scott Thomas is bored with being labelled an ice queen". The Telegraph. Retrieved 30 June 2015. ^ "Interview with Kristin Scott Thomas". The Guardian. 2 February 2008. Retrieved 14 May 2017. ^ "No mystery why we've loved Kristin Scott Thomas for so long..." The Independent. 3 February 2012. Retrieved 14 May 2017. ^ "Kristin Scott Thomas awarded higher Légion d'honneur by France". The Guardian. 14 July 2015. Retrieved 14 May 2017. ^ "Seagull Revival, with Kristin Scott Thomas and Peter Sarsgaard, Opens on Broadway Oct. 2". playbill.com. Retrieved 30 December 2017. ^ Comedy Theatre website "Ambassador Theatre Group's AmbassadorTickets.com", accessed 24 June 2011. ^ "Role-swapping: just a gimmick or an extra dimension to the drama?". London: The Independent. 29 January 2013. Retrieved 29 January 2013. ^ "Old Vic stages Kevin Spacey as Darrow and Kristin Scott Thomas in Electra". whatsonstage.com. Retrieved 10 May 2014. ^ "Kristin Scott Thomas to star as the Queen in return of the Audience". theguardian.com. Retrieved 10 January 2015.